WASHINGTON - FEB. 22, 2015 GOVERNOR ROBERT BENTLEY (R-AL) was presented the "Champion of Public Broadcasting" Award by APTS president and CEO, Patrick Butler. The Award is given to political leaders and other individuals who safeguard the ability of local public television stations to provide education, public safety and civic engagement services to their communities. 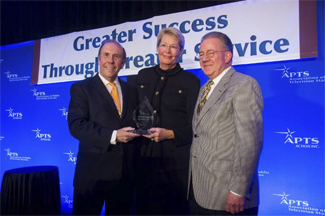 WASHINGTON - FEB. 22, 2015 APTS CEO, Patrick Butler and David Brugger, former APTS President and CEO, presented the 2015 Lay Leadership Award to HILMA PRATHER of Kentucky Educational Television for her outstanding work as a lay leader and advocate in the public broadcasting system. 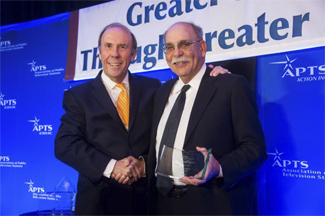 WASHINGTON - FEB. 22, 2015 ALAN POPKIN, Director of Television Engineering and Technical Operations, KLCS-TV, Los Angeles, was presented the 2015 EDGE Award by APTS. The Award is given to an individual who excelled in the use of technology, groundbreaking partnerships and other pioneering work to advance public television's public service mission. 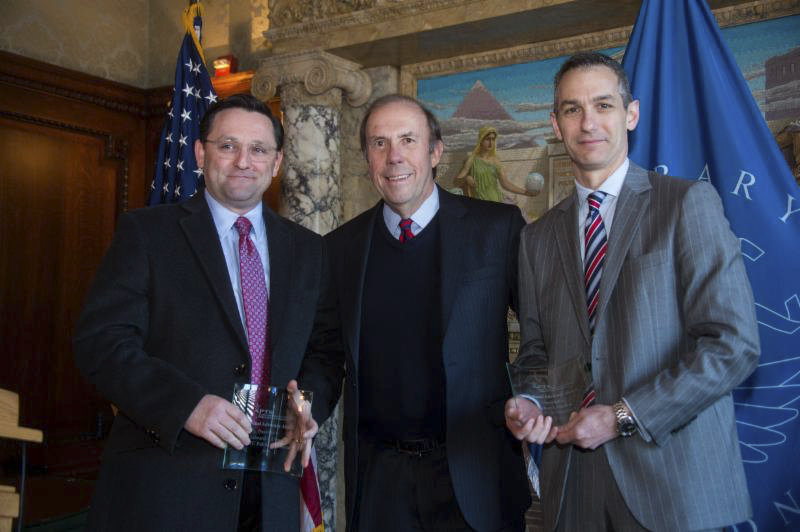 WASHINGTON - FEB. 24, 2015 The Association of Public Television Stations (APTS) presented the 2015 National Advocacy Award to Rob Dunlop, President and CEO, KCTS 9 and Ed Ulman, Executive Director and General Manager KBTC, for their exceptional efforts in furthering public television's legislative goals and marshalling grassroots support for public broadcasting. Both effectively communicate their local stations' services to members of Congress both in Washington state and Washington, DC. 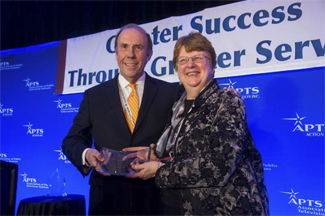 WASHINGTON - FEB. 22, 2015 Patrick Butler, President and CEO of APTS, presented GAIL PORTER LONG, recently retired senior vice president and chief education officer at Maryland Public Television, the Public Service Award for Excellence in Education for her contributions as a leader of public television's education mission. WASHINGTON - FEB. 24, 2015 - The Association of Public Television Stations (APTS) presented its Champion of Public Broadcasting Award to Senator Richard J. Durbin (D-IL). The award is given to political leaders and other individuals who safeguard the ability of local public television stations to provide education, public safety and civic leadership to their communities. Senator Durbin has been a steadfast advocate for public broadcasting from his time in the House of Representatives through his current service as Assistant Democratic Leader in the Senate. The Association of Public Television Stations (APTS) is a nonprofit membership organization established in 1979. The mission of APTS is to conduct - in concert with member stations - advocacy, planning, research, communications and other activities that foster a strong and financially sound public television system providing essential public services to all Americans. Its affiliate APTS Action, Inc. promotes the legislative and regulatory interests of noncommercial television stations at the national level through direct advocacy and through grasstops and grassroots campaigns designed to garner bipartisan congressional support. For more information, visit www.apts.org.